Interior design doesn’t have to be scary. 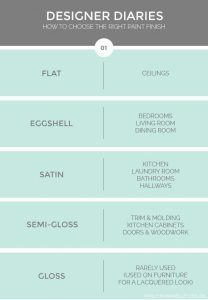 Choose items that match your personal style, use these helpful graphics and you’ll be feeling like a professional designer in no time! 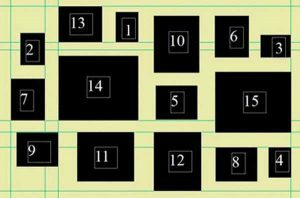 Create eye pleasing displays of artwork and photos. No matter how many photos you have, your wall will look neat and organized and not like a random mess. Thanks to lushome for our amazing walls. 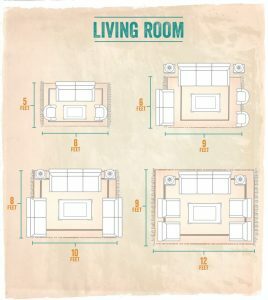 There are so many different sized area rugs that it can be difficult to figure out what sized rug is the best for your space. No matter the size of your room, the proper rug can make it look larger and create the perfect ambiance. More great layouts can be found at World Market. Do you hang your curtains exactly along the frame of your window? If your answer is yes, check out this graphic below. 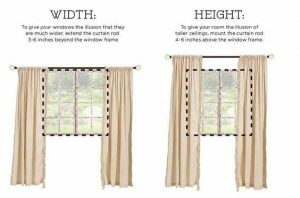 Hanging your curtains several inches outside of the frame can make your window (and your room) appear larger. Placing furniture can be tricky. 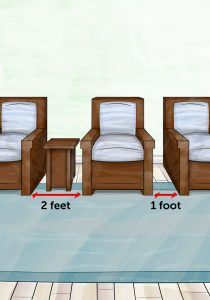 While there are no at-home requirements for how far chairs should be from one another, knowing a few guidelines can make you and your guests more comfortable. Get more placement tips at Oprah.com. Flat. Satin. Eggshell. Semi-gloss. What does it all mean? You can find this tip and more at BuzzFeed. What else would you add to this? Name them below and let’s chat!